Harley-Davidson made a radical announcement in July, promising to expand ridership, increase its global presence, and introduce new products ranging from electric bicycles to an adventure-tourer. The visuals were stunning but the details were lacking. So the folks over at the Motor Company invited a small group of journalists to Milwaukee during the 115th anniversary celebration to have a seat with the execs and ask away. And ask we did. Our group hurled questions left and right, mainly to be met with friendly but evasive responses like “details to come.” As Common Tread has reported previously, and as CEO Matt Levatich has often stressed publicly, Harley-Davidson is looking to grow two million new American riders while simultaneously increasing the company's international business to 50 percent of its annual volume. Let's take a look at their plans to do this. 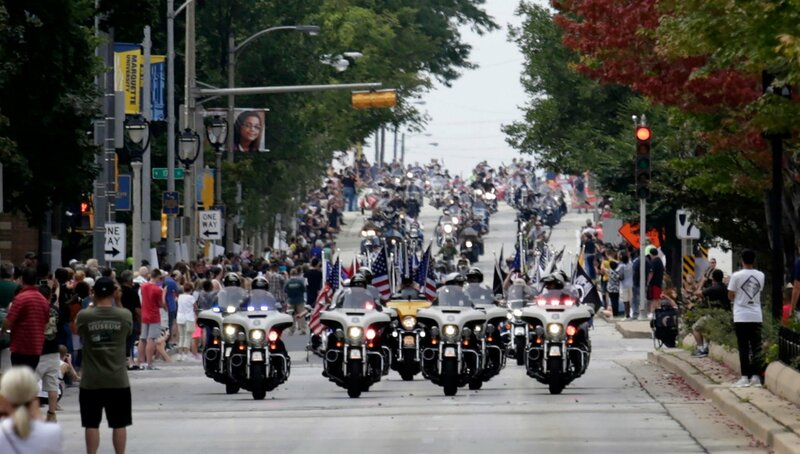 Milwaukee always warmly welcomes riders to Harley's anniversary celebrations. Photo by Darren Hauck/AP Images for Harley-Davidson. By 2020, Harley-Davidson plans to offer an all-new, currently unnamed, 250 cc model exclusively for India, the world’s largest two-wheel market. Massive government investments into road infrastructure and an explosive economy have led to a staggering average of 48,000 units being sold there a day. It’s a market every global CEO schemes about, but few have been successful tapping it. Harley-Davidson has been able to enter the Indian market. In 2007, regulators allowed the brand to open shop in exchange for the rights to export mangoes. Go figure. When the “mango diplomacy” deal passed, the large-displacement, American-made bikes were hit with effectively a 100 percent tariff. Not surprisingly, the combination of big displacement and big price tags equaled slow sales in India. Now, 11 years later, Harley has announced a plan to lower both. The Motor Company recently finished construction on a plant just south of Bangkok to take advantage of India’s free trade agreement with Thailand. New motorcycles can now be produced in Thailand and then sold to India (and other southeast Asian countries) with minimal or no additional taxes. Production is slated to begin there any day now. Opening an overseas plant raised eyebrows, and national headlines, as the announcement timing aligned with the closing of the Kansas City factory. Some riders, and the president, weren’t too happy. 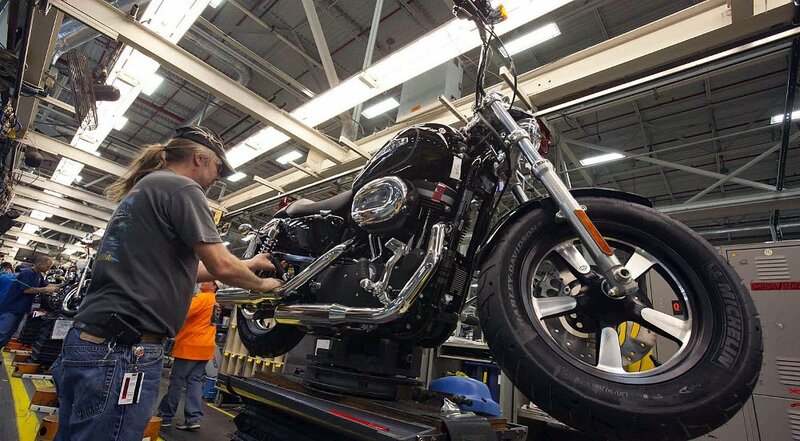 So while Harley-Davidson motorcycles sold in the United States will continue to be assembled in the United States, more of the motorcycles sold in other markets will be made in Harley's plants abroad. Harley-Davidson's participation in top-level professional racing is near a low point, but there was plenty of Harley-only racing at the 115th anniversary celebration, from hillclimb to flat-track to indoor short track. Photo by Darren Hauck/AP Images for Harley-Davidson. Will Harley-Davidson's incursion into India work? Harley-Davidson will have to become the definitive premium option in India, a title that currently likely goes to either Triumph or Ducati. Triumph is also entering the lower displacement market via a partnership with Bajaj Auto, which in theory could get them to market much quicker. There’s also Royal Enfield to worry about. They currently sell more bikes in India than KTM, BMW, Triumph, Ducati and H-D combined. Outcomes are not easy to predict, especially since both India and China have announced plans to ban new combustion-engine car sales by 2030. 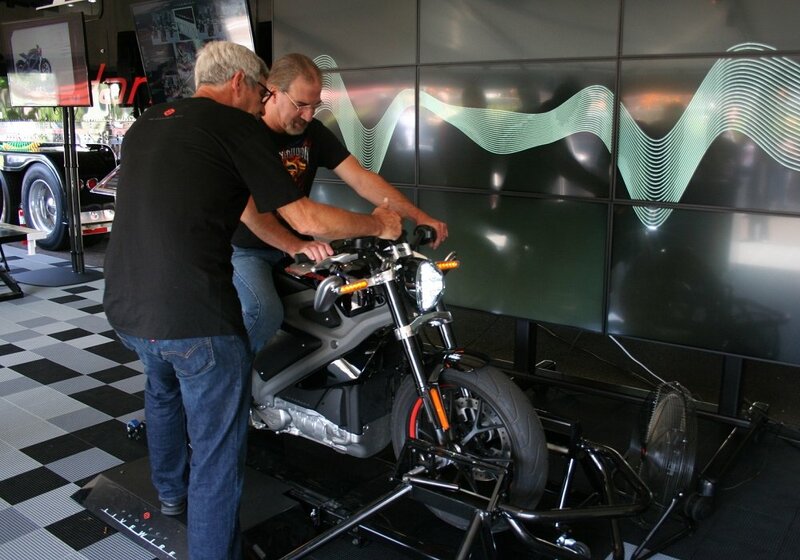 Just how will that impact gasoline-powered motorcycles? Harley-Davidson CEO Mat Levatich rode the LiveWire in the official parade at the 115th anniversary celebration. Photo by Darren Hauck/AP Images for Harley-Davidson. I think so. So does Harley. While I was in Milwaukee, I was able to see the new all-new 2020 LiveWire, which will hit showrooms in August, 2019. Details were very limited on the bike, which is being produced in York, Pennsylvania. Not all dealers will carry it but those that do will now have “customer-facing” Level 3 charging stations. The bike will come in three different colors (black, orange, yellow) and, I’m guessing, be very expensive. Rumors point to a range of at least 100 miles. Harley-Davidson has been working for years to expand its customer base and has had some success, especially with women riders. But the company still has more work to do. Photo by Darren Hauck/AP Images for Harley-Davidson. Between 2021 and 2022, two new electric models will be released. After that, we should see a bevy of lightweight urban models. The teaser materials show what look to be mountain bikes, commuter bicycles, and scooters, but no details yet. Harley does seem committed to electric. They just opened a new R&D facility in Silicon Valley where at least 25 new engineers are being hired to work on batteries, electronics, e-machine design, and advanced manufacturing techniques. It’s easy to picture how electric plays into their “new roads to Harley-Davidson” attitude. The proliferation of electric scooter shares are just one way step away from electric bicycle shares. Throw some knobbies on that and you’re off to electric mountain biking, which is, in every way I can imagine, the best type of dirt riding. Unless, of course, you’re one of those guys who loves bringing heavy bikes off road, which brings us to the Pan America. The limited-edition 2019 CVO Road Glide is laden with custom touches, but prices start at $42,339. Photo by Kevin Wing. Streetfighters, customs and adventure commuting? Harley is releasing two Pan America adventure-touring models between 975 and 1250 cc in 2020 and 2021. “We want to make sure we’re credible in the adventure-touring segment and we satisfy different usages. Whether a rider is commuting to work in the city on an adventure-touring bike because they’re higher and they can see better, or they’re actually going off road on an epic adventure across the Pan American highway,” said McAllister. We asked the obvious question of how Harley-Davidson plans to compete with brands such as BMW, which have deep roots in this segment. Nine new streetfighter and standard motorcycles are also coming between 2020 and 2022. The modular platform has been planned for 500 cc, 975 cc, and 1250 cc configurations. Expect at least one other displacement size in that range, as well. 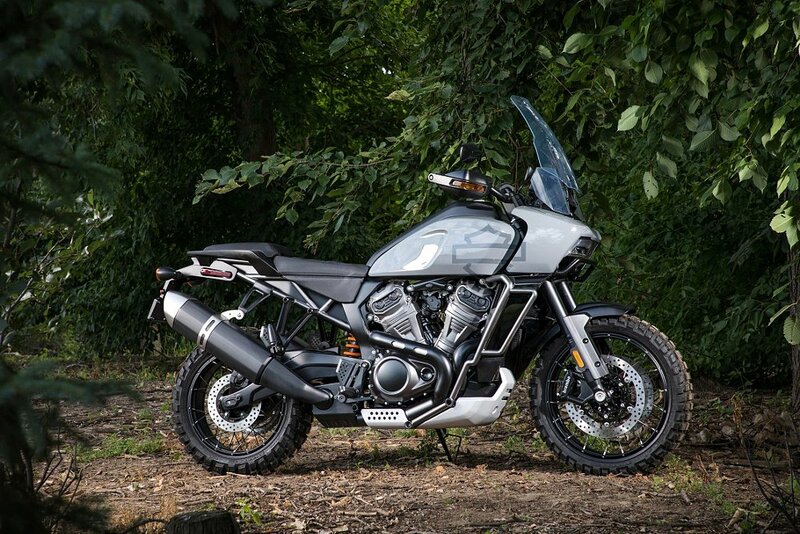 “The streetfighter segment brings us access to a younger, more urban customer, someone that we don’t reach today, or doesn’t have an obvious path to Harley-Davidson today,” said McAllister. Sooner or later, a little rain must fall into the life of every rider. When it does, it's good to have a fairing like the one on the Road Glide Special Chris is riding here. Photo by Brian J. Nelson. Despite all the internet chatter, all Harley-Davidson motorcycles sold in the United States are still assembled in the United States. There's no doubt that the decisions the company has made, from closing a plant to expanding production overseas, have rattled some of its core customers, even if it's a small number. Harley's touring bikes remain the company's best sellers, led by the Street Glide. Not only are they particularly important to the core customers, but they're even Harley's best sellers among new riders and women riders, according to Charlie Wartgow, manager of Motorcycle Product Planning. So while planning new lines, Harley must keep its core customers happy and its most popular products strong. Fortunately, Harley-Davidson touring bikes have never been better. The Milwaukee-Eight engine is fantastic and I had the chance to put several days of great riding on the 2019 Road Glide Special. If I could have taken any bike home from the lot, this would have been the one. Comfort and tech are all there, along with great suspension, confident braking, tons of power from the 114 ci engine, and a massively upgraded infotainment system with Boom Box GTS deliver on the premium experience H-D is constantly promising. The new navigation syncs to the Harley-Davidson app, making it easy to send specific destinations and preferred routes from your phone to the bike. Photo by Kevin Wing. The infotainment system impressed me by starting up quickly, being perfect visible in bright sunlight, and easy to navigate with intuitive thumb controls or by a touch screen (which worked even in rain with normal riding gloves on). It delivers exactly what I would expect, and I assume what a core customer would, as well. While Harley-Davidson must keep its core customers happy, they alone can’t get the company to where it wants to go. Today's riders might have grown up with dirt bikes and TV Guide, but the next generation of Harley-Davidson riders is being raised on electric scooter shares and Instagram. The Motor Company realizes this. They have a plan to do something about it. Now they just have to execute it.